LET’S BREAK THIS TIE TONIGHT! RYAN VOGELSONG’S INJURY TONIGHT WAS TRAGIC BUT HE WENT OUT WITH A 8-0 WIN OVER THE NATIONALS THAT REFUELED HIS TEAM AND I HOPE THAT ACCOMPLISHMENT WILL HELP WITH THE PAIN. THE SF GIANTS WILL PLAY HARDER FOR THEIR FALLEN TEAMMATE AS ALWAYS TOGETHER THEY WILL BE GIANT. The rest of the team had an amazing night at the plate Belt with a 4 hit night pounding his 6th home run of the season! Torres long overdue had a 3 hit night driving in the Giants first run of the game. Scutaro despite an error lengthened his hitting streak to 18 games. Total hits for the San Francisco Giants tonight-17! 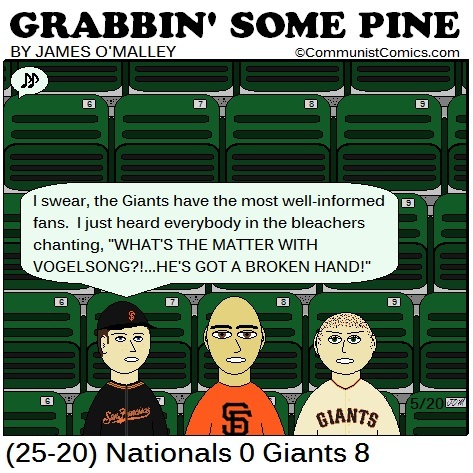 The offense also turned 2 double plays and after Vogelsong left the game with his injured hand our bull pen kept the Nationals scoreless.